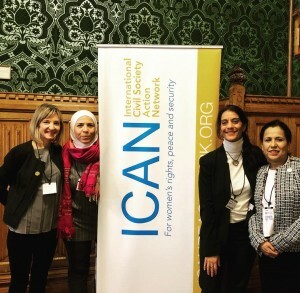 On November 29, 2018 ICAN partnered with the All-Party Parliamentary Group (APPG) on Women, Peace and Security and Gender Action for Peace and Security (GAPS) to host the event Invest in Trust, Invest in Women: Supporting local knowledge and experiences through equal partnerships and innovation. 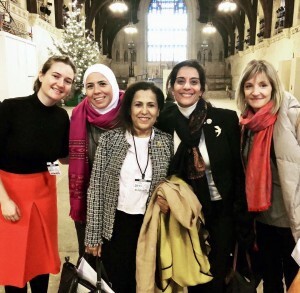 The discussion was held at Houses of Parliament in London with the goal of bringing together a variety of stakeholders to discuss and explore best practice for supporting Women, Peace and Security programming on peacebuilding and preventing conflict and violence. 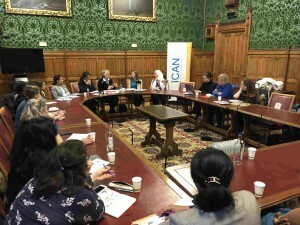 The panel was chaired by Baroness Fiona Hodgson of Abinger CBE and featured Ms. Shahrazad Magrabi, Co-founder and Director of Libyan Women Forum (LWF), Ms. Ghada Rifai, Co-founder of Mobaderoon Network, Syria, Ms. Sanam Naraghi Anderlini, Founder and Executive Director of ICAN, and Ms. Helen Thompson, Head of Humanitarian Programs, Care International UK. The event was an opportunity for ICAN to share the framework of our innovative funding mechanism for local women-led civil society organisations – the Innovative Peace Fund (IPF) and some of the work two of our partners are carrying out on the ground in Libya and Syria with IPF support. Ms. Sanam Naraghi Anderlini introduced the IPF and shared her rationale behind its inception. The need to shift the thinking from being risk averse to a willingness to invest in trust is at the core of the IPF. Additionally, the often rigorous application processes of big donors and the labor intensity required to distribute small grants often make funding unavailable to small organizations. The areas that the IPF supports (deradicalization and reintegration of fighters; prevention of conflict and promoting a culture of peace; influencing international and national policy; and sexual- and gender-based violence (SGBV) in conflict) were decided upon collaboratively with members of the Women’s Alliance for Security Leadership (WASL), the network of independent, locally rooted women’s organizations that ICAN spearheads. “The IPF is not about grantmaking alone but rather about partnership. We trust that our partners know what needs to be done,” Naraghi Anderlini said. In Libya, Ms. Shahrazad Magrabi is spearheading local initiatives on peace and security. “The IPF grants have allowed LWF to grow and expand its peacebuilding projects to respond to the evolving local needs and context,” Magrabi said. The projects include workshops to spread knowledge on peace and social cohesion in local communities, and using media to disseminate messages of sustainable peace. The Peace Circles that LWF have initiated in three regions of Libya (east, west, and south) with participants from some of the workshops are a great example of innovative ways in which the peace work can be further enhanced. LWF is now dispersing small subgrants to the some of the participants to implement community-based peace initiatives and establish further peace circles in their regions. Ms. Helen Thompson of Care International UK shared research findings from a new study, Women Responders: Placing local action at the center of humanitarian protection programming. Thompson emphasized the importance of ensuring that partnerships are principled, practical and meaningful and noted that gender mainstreaming requires a shift in how we do our work as well as in the mindset about partnerships. “We need to treat organizations as long-term partners, not as subgrantees,” Thompson said. ICAN would like to thank GAPs for co-hosting this event. ICAN thanks Global Affairs Canada, the Royal Norwegian Ministry of Foreign Affairs and the Department for International Development, UK for supporting the Innovative Peace Fund.